Hello Fern & Feather readers! My names is Vanessa and I'm coming to you from a little blog called The Voyage of V. I was super duper flattered when Alexis asked me to contribute with a tiny slice of the city I've lived in for a little over four years. Malmö, Sweden is all the way in the South West corner of the country, just a hop, skip and 25-minute train ride from Copenhagen, Denmark. Despite the fact that Sweden is a small country, there's quite a difference from city to city, and as the third largest, it has a strong character all its own. A little more laid back that Stockholm and Göteborg, easy going style is the name of the game. Accessory~ A pretty patterned head scarf does the trick for the beach or the bar. Shoes~ Clogs. Whether you're young or old. Male or female. High heel, low heel or somewhere in the middle. Clogs are as Swedish as Volvos and meatballs, and every single one of us has at some point in our lives worn a pair. I used to have a purple suede pair when I was little. Luckily they're back in and available in lots of styles. The sandal version is all over the city. Food~ Nothing says summer in Sweden to me like stekt strömming (fried herring). I like it best with mashed potatoes and lingon berries, but this sandwich was equally delicious. Need for survival~ During the summer, you definitely need a bike. And a really good lock. Music~ Robyn. Sweden is home to so many amazing musicians, but Dancing on My Own is the song of the summer. Scenery shot~ The Turning Torso, designed by Calatrava, is one of the most well-known buildings in the country and has become a real symbol of the city. Clothing~ Malmö is all about low maintenance fashion. The girls look great, but rarely like they try too hard. Because we're so close to the water, a belted t-shirt dress (like Rachel Bilson's) that can be thrown on top of your favorite bikini or worn out at night with heels is perfect. Art~ When I think of Malmö, I always think of this poster by the graphic designer Olle Eksell. 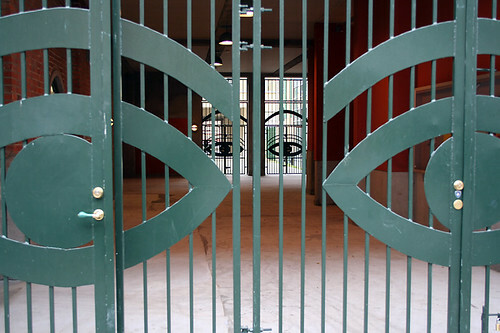 The eyes were designed for Mazetti's cocoa packaging, and a giant pair is casted in the iron gate at the old chocolate factory around the corner from my apartment. Two of my close friends gave the poster to me for my 30th birthday, so I will always remember the city when it's time for me to move on. great post! i was intrigued! Love that headscarf! Your town sounds lovely!! most amazing time, you all need to come with me the next time! Follow me on Twitter to get play by play photos and notes. Oh, yah! It's so nice to hear from Alexis. What fun she must be having. Loving this guest posts and learning fun little tidbits about everyone's home towns. Now I want some clogs. I want the headband, bike and close proximity living to a warm beach! Thanks, Alexis, for letting me sit in for a day! Hope you're having an amazing time in France. Eat a croissant for me! Lovely pictures, makes me want to visit!